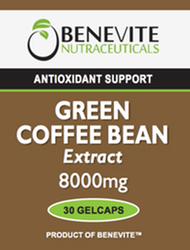 Benevite Nutraceuticals™ Green Coffee Extract may assist in maintaining normal blood sugar levels and assist in reducing the absorption of glucose in healthy individuals. Factors such as stress, alcohol, cigarettes and pollution may increase free radicals in the body and the potential for oxidative damage. The antioxidant activity of Green coffee can assist in protecting the cells in the body against oxidative damage caused by free radicals. Green Coffee Extract assists in the maintenance of a healthy cardiovascular system and helps to maintain general well-being. Helps to inhibit free radical cellular damage. Antioxidants are involved in inhibiting cellular damage attributed to free radicals and protect the body from the damaging effects of free radicals. Antioxidants reduce the risk of cell damage attributed to free radicals. Aids/assists in the maintenance of a healthy cardiovascular system. Green coffee is a major source of chlorogenic acid (CGA).